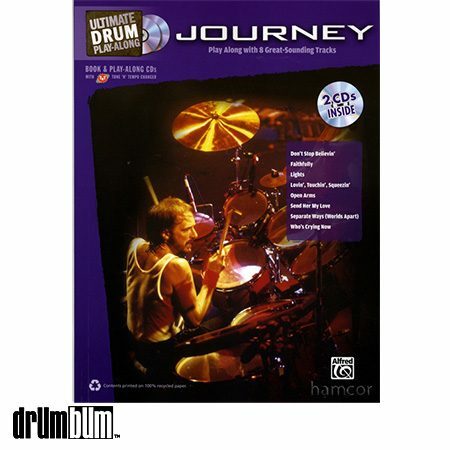 Journey Ultimate Drum Play Along Book/CDs – This Ultimate Drum Play-Along book gives you everything you need to jam with your favorite Journey songs. This book contains exact drum transcriptions, music notation, lyrics, and chords to eight Journey classics. For your convenience, in addition to the complete song charts, drum-only charts are included in the book and printable PDF versions are embedded on the provided enhanced CDs. There are two audio versions of every song on the included CDs: an instrumental sound-alike recording and an instrumental accompaniment track without drums so you can play along. When you use the CDs in your Mac or Windows-based computer, the TNT (Tone ‘N’ Tempo) Changer lets you access three versions of each song: the full-instrumental sound-alike, the instrumental accompaniment without drums but with a constant click track, and the instrumental accompaniment without drums and without a click track. Plus, the TNT software allows you to easily loop sections for practice, slow tracks down or speed them up without changing the pitch, change the key, and switch back and forth between the full-instrumental and play-along tracks. Journey songs included are: Don’t Stop Believin’ * Faithfully * Lights * Lovin’, Touchin’, Squeezin’ * Open Arms * Send Her My Love * Separate Ways * Who’s Crying Now. Softcover Book approx. 9″ x 12″ and 80 pages.